If you need any baking products, now is your chance to buy them! 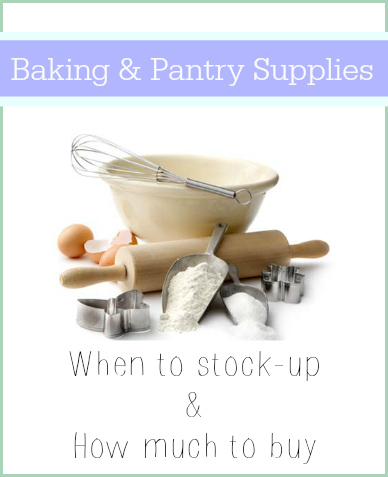 Unlike most items, baking supplies don’t follow a typical 6-12 week sale cycle. They are really only on sale during the Thanksgiving-Christmas season and then again around Easter time. If you don’t buy them now, you’ll have to wait until July 4th to see them on sale again. Now, you don’t need to go out and buy 100 pounds of flour, but you should stock up for about 4 months worth. This is your chance to restock your pantry for a fraction of the normal cost. Here are some items you want to be stocked on. Use the ingredient search on Southern Savers to see where they are on sale this week if you are running low on any of these items! Are there any other items you stock up on near the holidays? Learn about the tradition sale cycle.